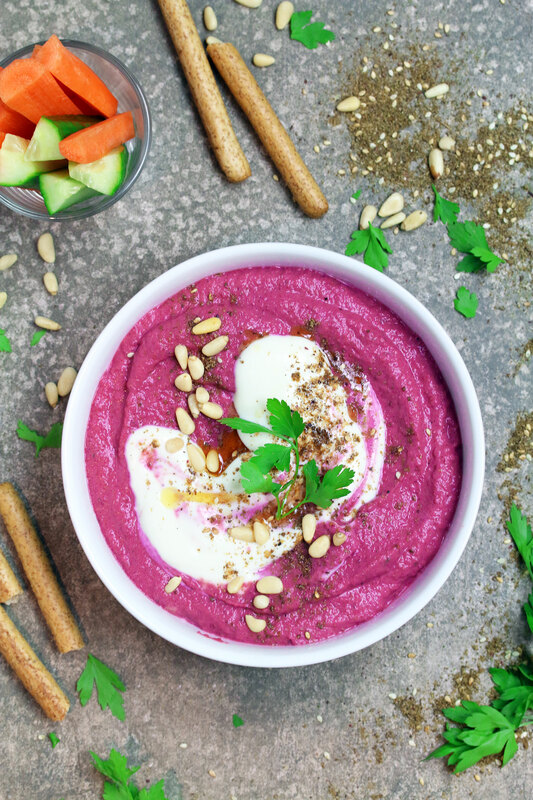 If you’ve been reading my blog for a while you’ll know of my never ending love for Hummus. What you may not know is I’m also a huge baba ganoush fan. What can I say, I was brought up in the Middle East and both dips were a big part of my diet and so have a very special place in my heart! Luckily as well as being delicious they also happen to be super healthy, high in fibre, nutrients and good fats! I don’t eat baba ganoush as much as I would like to since it’s slightly more time consuming when compared to hummus (which I literally eat on the daily! ), and when I do make it, it’s gone within a day or two. I just seem to inhale the stuff! I try to eat as many greens as possible and usually leave them bland and just add a huge tablespoon or two of hummus or baba ganoush on top. That’s my excuse for eating so much! Something else that I’m really into at the moment is beetroot. I usually eat it raw by grating it into salads and it adds so much flavour and the most beautiful vibrant colour to dishes. 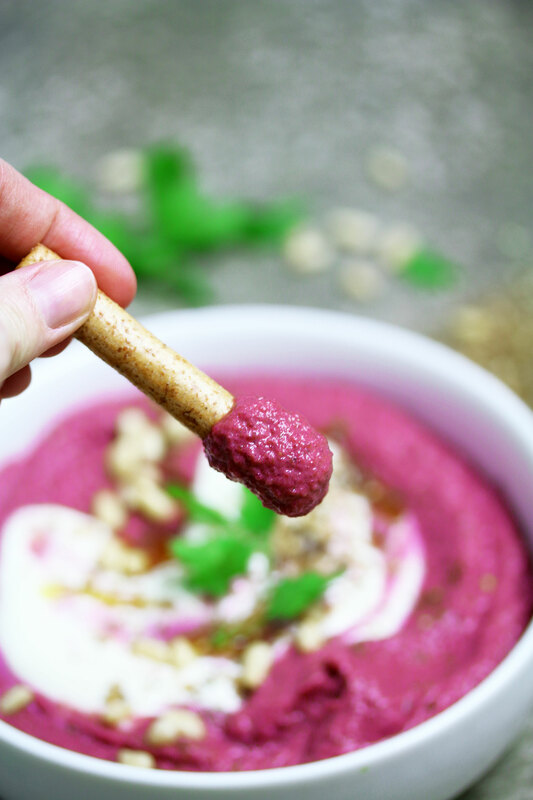 I’ve teamed up with Love Beetroot and Dan Doherty to recreate this Beet-a-ganoush dip (love the play on words there!) as part of their Don’t Skip a Beet campaign. It’s all about encouraging us to use and experiment with cooked beetroot in our cooking as a fuss free way to introduce powerful antioxidants into our diets. 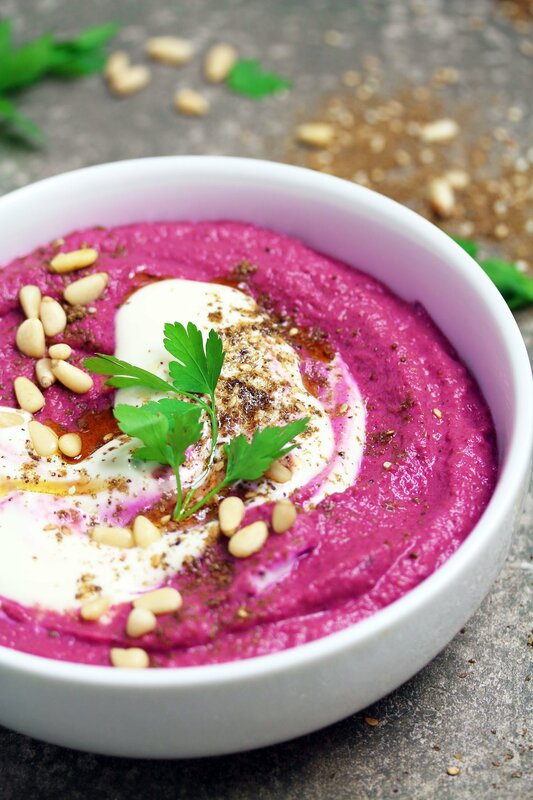 As soon as I saw this Beet-a-ganoush recipe I instantly knew I HAD to try it. How could I not? Not only is this dip delicious and versatile (try it on a pizza instead of tomato sauce! ), it also has the most beautiful and vibrant colour! Perfect way to get in some extra vegetables, nutrients and antioxidants. 1 tablespoon Tahini – I used more because I love tahini! 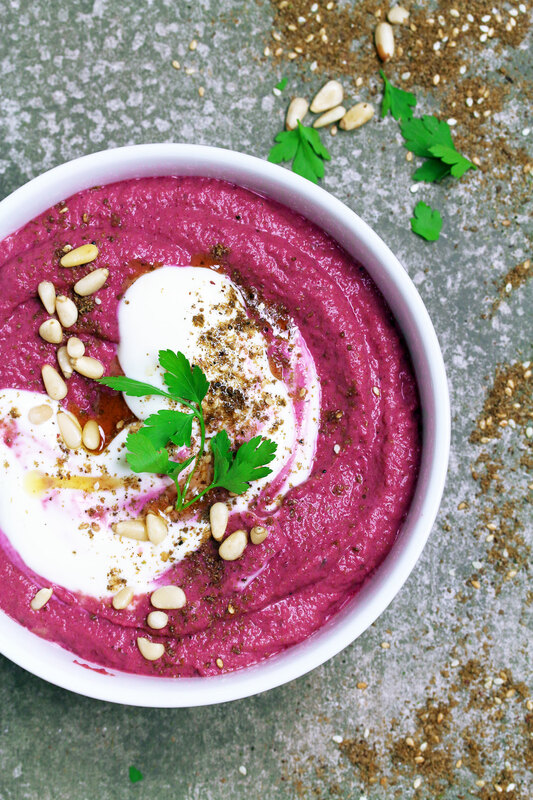 Head over to Love Beetroot’s website for more delicious and antioxidant packed purple recipes! This post was commissioned by Love Beetroot, however; all opinions are my own. This is the prettiest dip I’ve ever seen :). I’m loving that color. I too eat hummus regularly and don’t eat baba ganoush nearly enough. But I love beets so I’ll have to try your spin on it! I love the combo of beet and aubergine. The dip looks awesome. This on pizza would absolutely blow my mind. It’s gorgeous, and beetroots are such an underrated food. I’m trying to develop from using them simply in salads (although they do perform very well with a good dressing), to bigger and better beet-based dishes. This is the perfect happy medium, and will be a great next step for me. The combination of spices and herbs within it is right up my street.